Various musical artefacts from the ska revival scene have been reissued many times. The Specials and Madness albums have been released in a variety of configurations, while various compilation discs containing key tracks from the 2-Tone catalogue can be found very easily. The best ever compilation, ‘The 2-Tone Story’ (released by Chrysalis Records in 1989) provided an excellent overview of the label’s singles – A’s & B’s – alongside a few key album tracks. The only available CD reissue was a heavily edited botch-job, rather unfortunately; in order to fit a two record set onto a single 5” silver disc, several tracks were omitted. To make matters worse, the CD reissue omitted the set’s only previously unreleased offering, a live version of The Specials’ ‘Stereotypes’ (which should have been on the deluxe reissue of ‘More Specials from 2015 and wasn’t). A bigger travesty is that the live document of the time, a ninety minute concert movie named ‘Dance Craze’, has been rarely seen in pristine quality since its early eighties release. A home video was issued in 1988, but went out of print almost as quickly as it arrived; copies of this VHS tape are now as rare as hen’s teeth, copies on ebay surface occasionally but usually fetch prices of near £20. An LP of highlights was belatedly reissued on CD in the early 90s – a reissue of the 1981 LP and cassette – but is actually harder to find than those by-now scratchy video cassettes. 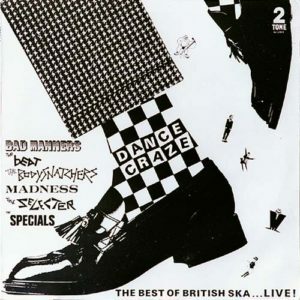 With The Beat and Specials catalogues having been reissued as deluxe sets, the first two Bad Manners albums finally getting an official UK CD release in 2011 and The Selecter going great guns on the live circuit (and with new material behind them) by the middle of 2015, we feel a proper and comprehensive deluxe reissue of ‘Dance Craze’ is more than overdue. In addition to releasing the 90 minute concert movie on DVD, such a set should include the complete soundtrack on 2CDs – a vast upgrade from the original CD. With the bonus of the unused tracks, we believe it would be an essential item for both obsessive fans and those with an interest in seeing these bands in their formative years. This entry was posted in Miscellaneous and tagged 2 tone, 2 tone dance craze, 2 tone dance craze dvd, bad manners, deluxe edition, madness, ranking roger, ska, the beat, the bodysnatchers, the selecter, the specials by Real Gone. Bookmark the permalink.